We believe that an amazing trip begins with an incredible start. So, as we turn a century, we’re bringing in a host of new technology and innovations to make sure our customers begin every journey faster, easier and more comfortably than ever before. So now, thanks to the NEW Hertz Connect device, you can enjoy complimentary Wi-Fi when you sign up for free to our award winning Gold Plus Rewards loyalty programme. The new Hertz Connect device provides an unlimited 4G hotspot for the duration of your trip, across Europe. What’s more, you can use it inside and outside your car, on up to 7 devices. So whether you’re trying to find that hidden local hotspot or just entertain the kids, you’ll always have the answer right at your fingertips. To get yours, simply begin your booking here, join for free, and when you spend over £250/€250 you’ll get your FREE device when you pick up your car. 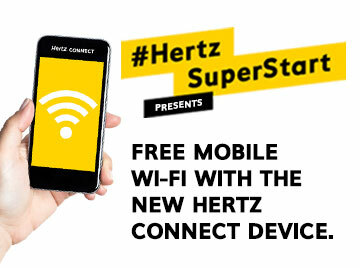 The free, ‘Go Anywhere’ Wi-Fi service via the Hertz Connect portable device is available for the duration of the rental to Hertz Gold Plus Rewards® members (Hertz Gold, Hertz Five Star and Hertz President’s Circle). Pick-up their qualifying Hertz car rental from any of the more than 100 participating locations across Belgium, France, Germany, Italy, Spain, The Netherlands and the UK. Book their car rental directly from the Hertz website as a Hertz Gold Plus Rewards Member. Those customers who are not enrolled into Hertz Gold Plus Rewards loyalty programme can become eligible by enrolling for free today. Spend more than £250 or €250 on their car rental and extras, or the equivalent of USD 250 when the transaction is made in any other currency. Rent for less than 28 days. All rentals will be subject to Hertz’s standard Gold terms and conditions applicable in the country of rental. In addition, customers will need to return the device at the end of the rental. You will be charged by Hertz if the device is lost or damaged. Click here to see the table of charges by country. Subject to availability. If the Hertz Connect portable device is unavailable it will be replaced by a mobile Wi-Fi unit. You are reminded that you must not use the Hertz Connect device whilst driving the vehicle. Insofar as is permitted by law, Hertz, its agents or distributors will not in any circumstances be responsible or liable to compensate the participants or accept any liability for any loss, damage, personal injury or death occurring as a result of the use of this device except where it is caused by the negligence of Hertz, its agents or distributors or that of their employees. The customer’s statutory rights are not affected. You can cancel your reservation online through the View/Modify/Cancel button or through Contact Us on our website. If you made a prepaid reservation and cancel no later than midnight two days before the date of your scheduled pick-up we will refund your reservation in full. An administration charge (see 'PRE-PAID ONLINE CANCELLATION AND NO SHOW CHARGES') will apply if the cancellation is made after this time and will be taken from the credit card you used to make your booking.